The Summit County music scene is all encompassing; no matter what beat you drum to, you’ll find that beat here. The numerous venues, bars, and restaurants around town have a very eclectic and diverse collection of live music. The different genres of music played all around town are endless; there’s bluegrass, country, electronic, jazz, classic rock, blues, reggae, funk, folk, and hip hop. No matter what kind of music you are into, you’ll find something that will make you dance, twirl, foot stomp, cut a rug, or sing your heart out to here in Breckenridge. The Riverwalk Center is clearly the biggest venue in Summit County, therefore allowing it to host some bigger name bands and bring in huge crowds. To name a few that have performed here, there are: John Hiatt & the Combo, Railroad Earth, The Devil Makes Three, Elephant Revival, The Wood Brothers, and Lyle Lovett. This diverse list of musicians includes an American rock guitarist and songwriter, a newgrass jam band, Americana, folk, blues, and country. This venue is a must see in Breckenridge; make sure to check out this calendar of events to look at upcoming concerts. You can count on the Motherloaded Tavern to pretty much always have something going on, whether it’s live music every Friday, Saturday, and Sunday, or open mic nights on Monday. The music is always free and on top of that, they have a great bar scene and delicious food! You’ll feel right at home. Some bands you might see roll through Motherloaded include: Stoney Live, El Passo Lasso, and Two Dudes. This is a mixed variety of mostly local bands who play anything from rock to reggae. Let’s move on to the Gold Pan Saloon, rumored to have the longest running liquor license west of the Mississippi; which is pretty legendary in and of itself. Add to that free live music, and I’m hooked. They’ve had anything from The Jason Spooner Band, who opened for Michael Franti at Red Rocks, to YAMN, a jam band from Denver. Now for Napper Tandy’s: this place has a massive dance floor upstairs for you to get your boogey on. There’s live music every Saturday night ranging from The Six Million Dollar Band (the ultimate 80’s experience), to Sublime and AC/DC tribute bands, and Von Stomper. Napper Tandy’s can get pretty rowdy if you want to have a night to remember. There’s always the Blue River Bistro as well if you want to enjoy your evening listening to some live music while having dinner and cocktails. They play live instrumental and modern jazz and delta blues from 5 pm to 10 pm most nights. If you simply just want to dance the night away, Liquid Lounge or Cecilia’s are THE places to be. They have DJ’s spinning electro, bass, hip hop, dance, and house almost every night of the week along with awesome drink specials! …Phew! If that’s not enough live music for you, keep on readin’! The Barkley’s Ballroom is a place I personally frequent at least once a week. They are quickly gaining momentum with their music scene and booking some amazing artists! Every week I get my twirl on for free bluegrass Wednesdays. Then, there’s also music every Thursday, Friday, and Saturday (most of it is free) and open mic night every Monday. Some bands that have rolled through here include: Beats Antique, DeadPhish Orchestra, The New Mastersounds, Karl Denson’s Tiny Universe, Malah, and Gypsy Moon. Barkley’s is also starting to stream concerts for free on the big screen TV’s and projectors that they have, which I’m a huge fan of. They streamed the Grateful Dead 50 Year Anniversary shows that played this last summer in Santa Clara and Chicago (this made a broke Deadhead like myself very happy). They also recently streamed the Merriweather Phish shows and are planning to stream more! Right next to Barkley’s Ballroom in Frisco is Ollie’s Pub and Grub! They have free DJ sets playing anywhere from hip hop to electronic every Friday and Saturday night. Local bands also play there sometimes. As you can imagine, this whole area is BUMPIN’ on the weekends with all of this live music! 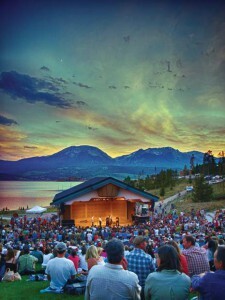 First, there’s the Dillon Amphitheater which is a beautiful outdoor venue overlooking Lake Dillon. From June to September, there is a free Friday night concert series, and also from July to September, there is a “Sunset at the Summit” concert series. Did I mention the breath-taking sunsets you can check out while listening to live music? Some artists that have performed here include: The Beau Thomas Band, David Grisman, and Honkeytonk Voodoo. They have booked anything from bluegrass to rock, and anything in between. Movin’ on down into the Keystone area, we will start with The Goat Soup and Whiskey Tavern. They close down for the summer, but in the winter, expect live music every Friday and Saturday and DJ’s every Wednesday. There are all sorts of bands that have played here such as: Yo Mamma’s Big Fat Booty Band (yes, that’s their real name), Led Zeppelin and Pink Floyd tribute bands, and Funky Johnson. Right down the street, we have the infamous Snake River Saloon, which has a plethora of live music every weekend. Sometimes there’s a cover, but it’s only five bucks or so (which is totally worth it). They have rock bands, bluegrass, country, soul, blues, funk, electronic, and reggae. Pretty much covering all of the bases here. You may have heard of Funkiphino, Brian Hornbuckle Band, or High 5. If not, be sure to head on down to the Snake and check ‘em out! Finally, we have our last venue: Warren Station. This place doesn’t book a lot of live music, but when they do, it’s a party. Keller Williams plays there every December, they hosted The Motet this last February, and Head for the Hills played a New Year’s show. If you get a chance to see live music at Warren Station, do it! If you’re in town and craving live music, check out any of these local spots! I guarantee there will be live music that you like somewhere… what are you doing still reading this?? Put your dancin’ shoes on, and get on out there!